Coating Tech Slot Dies is a slot die manufacturing company focused on solving problems for our customers. The Science of Slot Dies are words we use to describe our business because slot die is the primary focus of our business and we are dedicated to making real scientific advancements for our clients in coating industries. We make products that work, and we make sure they work for you. Our team is experienced and large enough to provide depth yet small enough that the entire team has knowledge about your project. Our experience with wide ranging clients and prior industry experience helps us understand that the function of the die is most important, and we work hard to learn as much as we can about your project up front to provide realistic pricing and delivery schedule for every product. We want to be sure that the equipment you are quoting and potentially buying will work for you. We want you to get the best value out of your new equipment and the best performance for your budget. Beyond designing and manufacturing precision equipment for your coating line, we have a service and consulting department. Our field consultants are experienced individuals with science and technology backgrounds to solve issues for you. We work alongside your team to develop solutions while teaching and documenting the process to encourage enhanced in-house problem-solving ability at your company. We also have alliances with other knowledgeable consultants in related fields should the issues need a referral or a larger team approach. 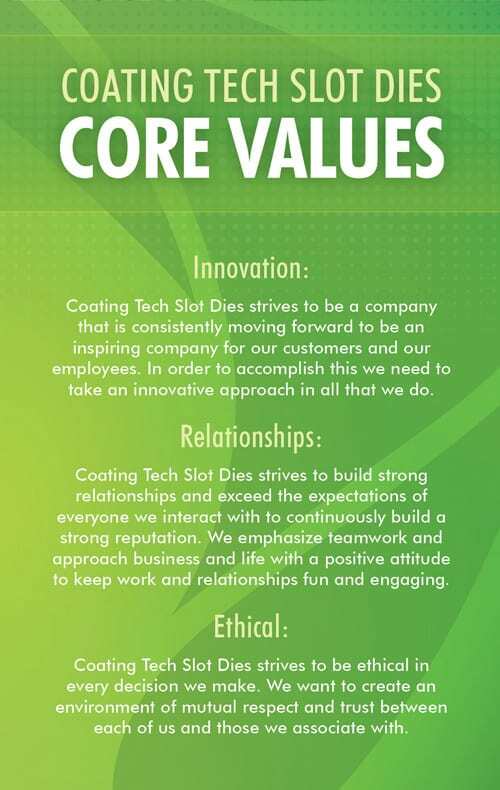 Coating Tech Slot Dies strives to build strong relationships and exceed the expectations of everyone we interact with. Equipment manufactured by Coating Tech Slot Dies is made in the United States. Our company headquarters is located in Eau Claire, Wisconsin. Sales offices include Minneapolis USA, South Korea, China, and Taiwan.